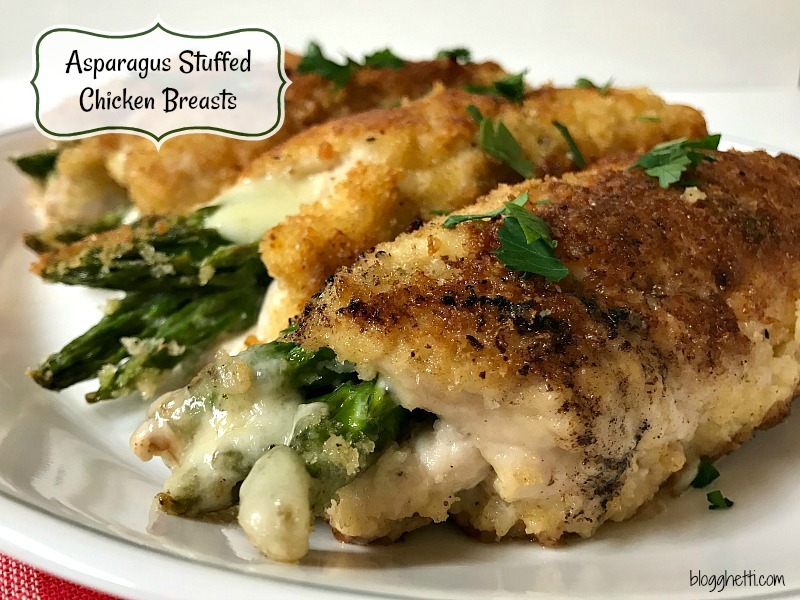 These Asparagus Stuffed Chicken Breasts are oozing with provolone cheese and turn out so tender and moist. Simple enough to prepare for any night of the week, yet elegant enough for a special occasion meal. Most of the recipes on the blog are made rather effortlessly; but there are recipes I make that require some effort and time devoted to the preparation process. This Asparagus Stuffed Chicken Breasts is one of those recipes. It may take a bit more time to prepare but the cooking time is under 40 minutes and is totally worth the extra minutes it takes to assemble and brown up the stuffed chicken breasts. We love serving this Savory Herb Rice with the stuffed chicken. Preheat oven to 350 degrees. Spray an 8-inch oven proof baking dish with non-stick spray. In a large oven-safe skillet, bring ½ in. of water to a boil. Add asparagus; cover and boil for 3 minutes. Drain and immediately place asparagus in ice water. Drain and pat dry. Flatten each chicken breast to ¼-in. thickness. Spread mustard over one side of each chicken breast. Down the center of each, place a cheese slice, ham slice and four asparagus spears. Fold chicken over asparagus; secure with toothpicks. Prepare your breading stations by having separate shallow bowls for flour and eggs. In a third shallow bowl combine the Panko bread crumbs and Parmesan cheese. Dip chicken in the flour, egg, then bread crumb mixture. In a large skillet, on medium-high, heat the butter and olive oil till hot. Then brown each chicken piece on all sides. Transfer the browned chicken breasts to the prepared 8-inch baking dish. Add chicken broth to skillet, stirring to loosen browned bits from pan. Pour chicken broth over chicken. Bake at 350 degrees for 20-25 minutes or until done. OMG – I added a few fresh mushrooms – didn’t have the ham and we aren’t mustard fans. Used provolone cheese too,. ABSOLUTELY WONDERFUL! I bet the mushrooms were super delicious. I’m going to add those next time! Very good. Used provolone cheese and ham with mustard. Keeping this recipe. Cooked it in oven in the cast iron fry pan that I browned in. One pan. Thumbs up for us.